A reader wrote in to say he’s frustrated with Windows Live Mail, which is part of Windows 7, and would like to have Windows Mail back, which was part of Vista. Why does Microsoft keep changing stuff we like? It’s their job, and they’re really good at it. First there was Outlook Express, which worked fine. 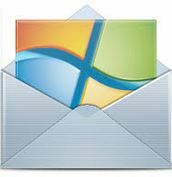 Then came Windows Mail, which was confusing to anyone used to Outlook Express. (See: they are good at messing us up.) Then came Windows Live Mail, which is more like Gmail (because Gmail was already out and people liked it, so they had to face some facts).